In the words of the maker Brian Wampler, this was designed to sound "sort of like a cross between a "Marshall 18®" and a "JTM45®", and those who have purchased the Plexi-Drive agree that it's very accurate! The bass boost toggle switch adds fat, full bottom end which is very useful in lower gain or lower volume (bedroom practicing) applications. For band volumes, cutting the bass out a bit really helps the tone cut through perfectly." Some people experienced popping which can be due to the input being connected directly to the first JFET gate. This is a modified version which adds an input capacitor and anti-popping resistor. Hey, thanks so much for the layout! I'm gonna try it out. I was wondering what to remove to skip the switch and just stick with it stock ? Oh and what's D1 ? Well the switch came with the original (the first pic is the stock circuit), but if you don't want to include it just omit the Sw1a and Sw1b wires (obviously) and the 2n2 cap above Q1. D1 is a reverse polarity protection diode, and you can omit that entirely without affecting the pedal audibly. In fact I really don't like parallel protection diodes when they're used without fuses because in the event of reverse polarity, they basically explode which isn't going to do the pedal much good anyway. It seems like an unimportant inclusion for people using batteries or dedicated daisy chained power supplies anyway to me, but I included it because it was in the original scheme. Awesome, thank you for this and all the other layouts. You have no idea how grateful I am for all this work of yours! By the way, do you know the insides of a Lovepedal Kanji ? I think it was a limited thing and I wouldn't be surprised it it was just a modified Eternity or something. Just wondering if you know anything about it. ProGuitarShop used to have them and I remembered by the videos that they sounded quite good. Would the switch be on-on? It's single pole single throw so it's always 1 contact, 2 lugs, 2 position, on or off (contact make or break). You could use a SPDT switch though and just use one of the "throws" and so the centre and one of the outer lugs. Ahh think I got, so I just use middle and outer lug on a 2 postion switch? Yes they would be fine mate, but at that price you'd probably be better getting some 2 position SPDT which will then have two uses (SPST or SPDT) and you should be able to pick up 10 cheaper than that. Oh right.. pennies dropped. I have loads of SPDT's.. I'll use them. I've built this, sounds amazing but my tone has no effect? I notice it goes from board to tone 3. And tone 2,3 and vol 1 to ground? would that have anything to do with it? I just checked and it's actually Tone 1, with Tone 2 and 3 connected to ground. Oops, sorry. But that's definitely how it is in the schematic. Tone 1 connects to the 10n with the other side of the cap going to the 15K and Volume 3 junction which looks right on the layout. I've just changed the pot with no change? it's like the tone is completely bypassed. Everything else works as it should. But I'd have to build it up to have a play. Hmmm It's bizarre and a shame as it could've sounded among the best.. I've checked over and over and as everything else is working perfectly, I can't make out what could be wrong. I don't really want to dump this as it sounds nice but OCD and impatience will get the better and it'll end up scrapped. Just put it to one side. You don't have to throw it immediately, wait until I get to experiment and then there may be a decent mod for the tone which you like. It's better being left in a drawer for later than going in the bin. I've got tons of boards all over the place that I built but didn't bother boxing, one day I may revisit some, but I'd never dump anything! Just to note, I took out the 10nf cap with no difference to anything. Not sure if that's relevant but thought I'd mention it. Ok, Mirosol. Thanks anyway. I've usually binned it by now but it really does sound good and the problem seems to minor as I'm getting effect signal coming through. I'll hold on a little longer. Ok,Wheres Jeremy Beadle and his camera?! because this is taking the effing piss now!. I've rebuilt this from complete scratch and I got the same results!? lol.. I've even un soldered the tone pot completely and it still sounds the same? ...I've tried the 'tone 1' wire on all lugs and even just frantically prodded it all over the place, it's dead? nothing. It squeals if I prod the gain lugs and thats it?! Ok, it's totally dead now and I've had enough of it. It's binned. A shame but that was really winding me up. D1 is a reverse polarity protection diode, can anyone give me a designation for it. can i use a 1N4001 ? just built this one today. it works perfect..... AND MY TONE CONTROL DOES TOO ;-). looking at the layout and schematic, i don't know how it couldn't. BTW, it sounded great with just a random trio of J201's that i grabbed from my inventory. then i went thru about 40 J201's until i found three of them that have a drain voltage from 4.48-4.53V and it sounds even better. Thanks for the feedback John. Did you do any mods on it to make it bass friendly? i changed the bass switch cap to a 4n7 (i tried a 10n and a 22n but they all sounded nearly the same as the 4n7). with the bass switch in, it makes a nice bass distortion pedal. here's a couple of pics of my plexidrive build. i ended up using two 220u caps in parallel foir the PS filter since the original has a 470U. Is it possible to use 2n5457s or 2n5458s? might be running out of J201s and i have loads of the 2n545xs. And is the 2.2M resistor a dropdown? Am i able to put a 1M resistor in its place? Does changing the drain resistor values(to get 4.5ish Volts) affect the usable range on the gain knob? Well the gain control here is like the Big Muff and sits in between the drain of Q1 and gate of Q2. So biasing Q1 would affect the gain range you get, but it is pretty much a moot point when the most important issue is biasing the JFET correctly so the gain sounds better. With that in mind the JFETs should be biased with the gain control in the position which it is likely to spend most of its time, and so most people would want to dime the gain when biasing. Makes sense, but what does "dime" mean? all the way up? and.. one more question, if i want more gain, is it possible to swap the 1k resistor connecting Gain-1 to ground for a higher value? That's a minimum gain resistor which determines how much gain you will get in the counter clockwise position of the Gain pot. Decrease it for less, increase it for more. Killer circuit. 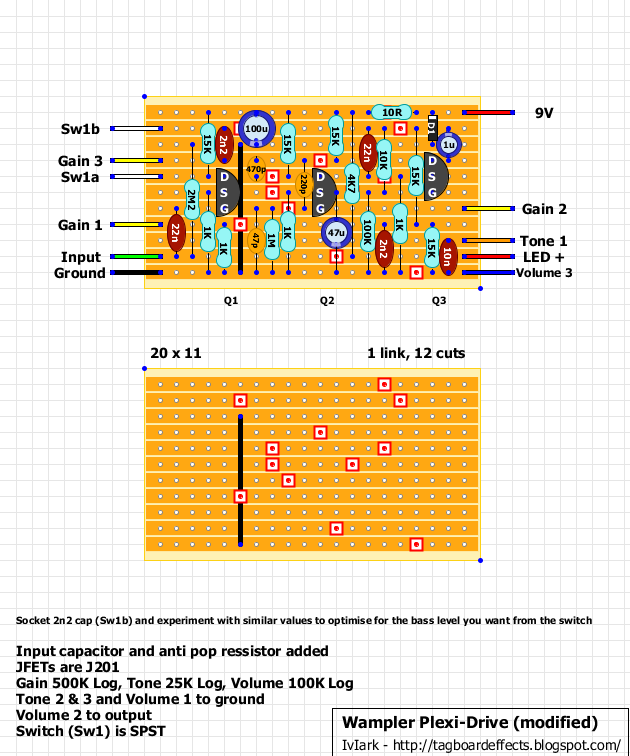 Great power amp emulation. Knocked a Catalinbread Dirty Little Secret off my board. 1 is the drain to much? 2 should i have volatge on q3? You should set the voltage to what sounds good to you rather than concentrating on the voltage measurement, but 4.8V sounds close enough to me anyway. The problem is undoubtedly the 0 volt reading on Q3. If it has no voltage on any pins then it isn't passing a signal so that needs investigating. hahah as always i missed a resistor from v to q3 it runs perfect. if it's only doing it on one string, it sounds to me like it's your guitar and not the pedal. Also, I was thinking about doing these Wampler ones with trimmers to set the drain voltage. How would I go about putting these on the board? Hello, just built this one and had some troubles with the bias settings. I had just bought a bag of 4 j201 so I had to manually set the drain voltage for Q1, Q2 and Q3 via different resistor values on my breadboard. I used 10k for Q1 and Q2, and 7.4k for Q3 in order to have my drain voltages sit in the 4.5-5V range. Could the overall gain of the effect be affected by changing the 15k default value for bias resistors ? When the gain is cranked all the way up the sound is overdriven but it seems a little anemic to me. Please correct me if I'm wrong but Q1, Q2, Q3 gain can be roughly calculated by dividing the drain resistor by the source resistor value ? So with 15k it would be a gain of 15/1 ~= 15 for each j201 but with 10k it would be ~10 ? Well, problem solved. The tone was working, but simply, a 10nf cap was no enough. I replaced it with a 47nf, and now is a real tone control. I had to replace the drain resistors with trimpots, so I could bias the fets properly. I went for the original version and seem to be ok with popping so far, but I have only tested it on a smaller amp, to check it was working OK. Hope I won't get a pop when I use it at higher volumes with my band. Say I want to replace the bass toggle switch with a pot, so I can really dial in how much bass I need... What value would you recommend? Also, I was thinking using an audio pot, with the signal coming in via lug 3, and out via lug 2. Should lug 1 be connected to ground, left as is, or linked to lug 2? You can't replace the switch with a pot, because the switch just drives in a 2n2 cap into the circuit, so, no pot (resistor) can't replace it. Second question: One wire to lug 3 and other to lugs 1-2, or just to lug 2, and leave unconected lug 1. Thanks for the reply, JaviCAP. Can the PS cap be replaced with anything between 100uF and 470uF? OK....got it...sounds great with the 22nF input cap but any thing above sounded great too. If you ever wanna play bass on this pedal better put a larger 220nF or even a 1uF cap in there. The TONE control is a bit too subtle and that's a pitty for such a great pedal. The J201 FETs were tested from a lot of about 40 and I tried everything from 4V to 6V and I believe the best crunch I got resembling the strength of the YOUTUBE videos was around 4.7-4.8V on all 3. I guess 5V would be OK too but 4.5V was a bit weak. Swapping the input cap alone for more bass doesn't quite help as the bass boost switch will cut it right after the first gain stage. One would need to up the 470p and 2n2 caps too. 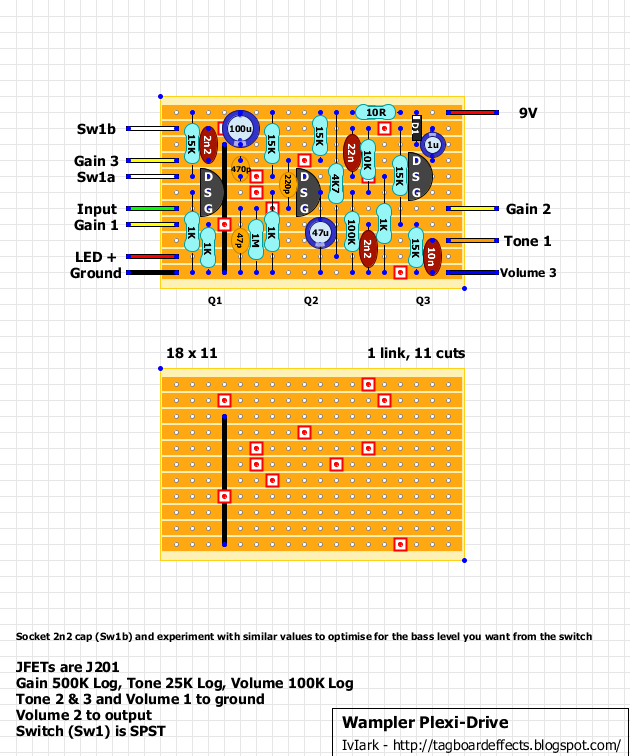 Just built this , decided not to use the trimmer layout as I plan to build some of the other samplers which don't have layouts with trimmers. I matched my j201 before building and after tweaking the resistors I have all biased at 4.5v .sounds great , can't wait till tomorrow when I can crank the volume and test it properly. Thanks for these great layouts. Any suggestions on a cap value substitution for the bass switch? I'm looking for something in between. The 2n2 sounds a little "woofy" to me but it's too wimpy with it switched out. Otherwise it sounds great! Please, what i do with the +Led output if i don't want to use 3PDT switch? Just ignore it, and you can ignore the 4k7 resistor too. If you want to use conventional true bypass wiring you won't able to have LED indication though, or if you really want LED indication but only want to use a DPDT stomp then you'll need to use millennium bypass, which you'll find a layout for via the search box above. Might seem like a dumb question, i have no knowledge of electronics but can you tell me where the output is on the board? or does the volume 2 to output go to the foot switch? Do you know what is the best type of wiring for the foot switch? When you are biasing the J201s to get the 4.7vs, are you supposed to be playing through the Plexi or do you ground the input? Since I matched the J201s, now each measuring 6.43v at the drains, can I simply tweak the 10R resistor to get the 4.7Vs.on all 3 J201s? Many replace it with a 5k trimmer? Thanks Mark, swapped out the 10R with a 1k trimmer, biased all 3 @ 4.7 and it sounds great! Going to leave the trimmer in place so I can tweak some more if the mood strikes. I'd like to add MIDS to my circuit. everything sounds great with it but it could use a bit more in the middle. Having a mid-toggle would be very nice! What component(s) should I change? Thanks. Wampler clone's done. Great sounding, thank you for this awesome layout. So i plug a 7 band equalizer to fix the problem. Maybe I should put a switch or a pot more to avoid using an equalizer but I don't know where ? A question: Why are the fets underbiased?? I did not like the sound and biased the fets to the point where it must theoreticaly must by: 0,6x9Volts and a little bit more, so 5,5 volts. It sounds much less harsh to me. Your thoughts are almost on spot, but wrong. The original does not have an input cap. Check any guitar amplifier schematic and you'll see there is nothing but resistance between the input jack tip and the preamp tube grid. There are other JFET pedal designs in the wild that are also "missing" the input cap. So omitting it isn't exactly an engineering error. If i was to build or design one, i would most certainly use an input cap, but with JFET or tubes it's not mandatory. 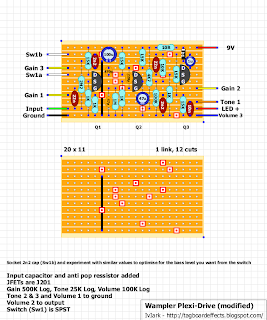 On a side note, i did draw a modified version of this, with input cap and with trimmers for each gain stage. With that layout the FETs can be easily tuned by ear. Which is usually way better method to bias JFETs in comparison to some known voltage. Thanks for your input. 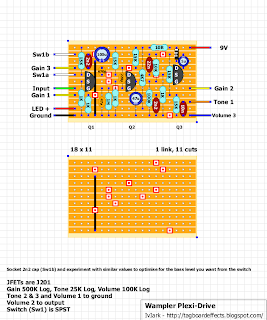 I have a hughe amount of amp schematics and Yes the Fender and many copy's of the Fenderamps (even Marshall was a copy of the Fender design) do not have an input cap. Many other more modern tubeamp designers do have that cap like Borgner, Trace elliot, Peavy, Ampmaker aso. Mind you that Leo Fender was a radioservice man and not a tube amp designer. Pick a tubeamp design web and you see they all have an input caps to isolate the gridresistance from everything that is before that stage. http://www.valvewizard.co.uk/Common_Gain_Stage.pdf f.i. The fact that there are no input caps in many amps is that they copyed from old Leo. I looked at all the wampler jfet design available on the net and they all have the input cap. What about Voxes and Laneys? I don't think those are fender copies. Plus there are no Wampler factory schematics around, so there is a chance the schematics you refer to have been modified by adding an input cap. On a side note - check all of the JFET designs at Runoffgroove.com. Take a look at the Fender tonestacks. That was a very bad design! Take a look at the tonestacks of the Marshall/Vox/Laney's and you see they are almost the same bad design. Let's go on topic: You have two almost the same pedals: one is plopping an make bad klicking noises when you engage it and the other is death quite. Which one is the good design??? Starting to build this one now. Anybody has a list of mods to somehow implement some of the new features of the new DELUXE version? I just thought of maybe adding a switchable top boost on top of the switchable bass boost, and a switchable pre-gain boost to add that extra hair. Oke, I build during the last years this pedal and many more with JFets in it. Instead of the drainresistance of 15 kOhm you can place a trim resistor. I always build these with a trim resistor of 100kOhm. Then adjust the drain voltage to about 5 Volt (Usupply 9 V) as everybody tells. But.. the pedals I build sound never so nice as the real one's I hear on YT! Made many changes in the schematic but all of them sounded nice but not good. Especialy this Plexidrive laks a lot of drive. I kept the pedals on the shelf and did not use them, till yesterday! I was trying again to make the plexidrive like I hear on YT. But nothing helped till I turned the trimpots on a drain voltage of 2,5 Volt. And voila the Marshall was in da House. Big Big screaming marshall tone's. I have 9 diff. stompboxes and I have down-drained them all to 2,5 Volts (drain to ground voltage!) and it works. I have beatiful sounding boxes now. Go ahead and try this. I made the circuit and plays really well. The only strange thing is that to get an acceptable distortion, I had to increase the values ​​of the relative strengths of the Drain Q1-2-3 from 15K to 100K, arriving to obtain a voltage of about 4.5V. Now I wonder: is it possible to get this tension must reach resistance so high? Maybe I of J201 defective? I saw then that there is a layout with the trimmer from 50K to set the tension, but would be insufficient trimmers from 50K in my case. Then I would ask you to increase a little 'can I increase the gain still resistance from 100k to obtain a lower voltage on the Drain of Q1-2-3 (maybe listening ear to the result)? And finally, the tone control works well in close but even when the tone knob is fully open, the overall sound seems a bit too gloomy and dark. What I would do to get more brightness general? Problem solved. I replaced the J201 with 2N5457 and now all OK. I think the J201 was defective. I have about 40, and they all have the same defect. With 2N5457 I had no trouble calibrating the bias voltage and the pedal now is perfect. Quick bias question: If I build this up on the breadboard and leave the stock 15k on Q2/Q3, then install a 20k pot to Q1, bias it to 4.7ish volts, can I just do that through Q2/Q3. Or does Q1 bias impact Q2/3 where I need to tweak them all together to get them all dialed in to 4.7ish? Thanks! I read somewhere that Velvet Fuzz is supposedly very close to this design? I am new to effect building, but it is incredibly fascinating. Can someone explain to me the function of ceramic capacitors on the circuit? The 47 pF to earth is in conjunction with the 1M res. a high rolloff filter. The 470pF is a kind of low pass filter. Anyone has been around the plexi deluxe? Can't seem to find anything about it in the usual forums! Plexi Drive deluxe please???!!!! Anyone??!! Does anyone have the diagram for the Wampler plexi drive deluxe? Need help troubleshooting... awesome layout and information, by the way. I have verrrry low volume out of this thing, and no gain. I have to turn my amp up to 9 to get anything out of it...I normally have my amp on 1 or less. 3. no signal past R7 (10k resistor feeding Q3). Any more help is greatly appreciated. I've made several of these over the years and find that biasing isn't too challenging as long as you can get a handful of JFETs with very similar characteristics. Simply replace the 10ohm resistor with a 10k trimpot, and you can bias all three at once. Load 3 JFETs in, adjust the trimmer until you're near 4.5v on at least one of the JFET drains. If the others are out of whack, swap them out with the others in your bag until everything is in the ballpark. This way, you can also experiment with hot or cold biasing the whole circuit in one go. This has worked well with J201, 2N5457, and 2N5458 for me. In my opinion by doing that you are not "biasing" the FETs but you are doing what a "starve" control would do. Changing the supply voltage is different to biasing the JFETs. For example, if I power this pedal with a 9V supply, then switch to a 18V supply, I really didn't change the "bias", I just changed the power supply. I think you will find that you can just forget about that trimmer because the fixed drain resistors are actually biasing the FETs in a way that you apparently like. And I get what you mean with the regulator, but the required voltage would be dependent on the characteristics of the set of matched JFETs, or need to be adjustable. In which case, a trimmer seems easier IMO. In this specific application, I guess I don't understand the difference: we're just trying to get the drains to read 4.5v, and there is nothing else drawing power from that supply rail. So, maybe I am missing something obvious? Of course, all of this is moot if your JFETs require different fixed drain resistor values. Ivlark: great build - thank you! Tested last night, worked like the Youtube videos. A really nice pedal, took me about 5 or 6 hours. I used 50K variable resistors for the drain-bias, which came out to about 6.5K each to achieve 4.9v between the drain and gate (a little higher than half-voltage from supply sounded the best). Sounds like the behaviour i had with "aliexpress" J201s. They seem to bias correctly, but do not give out the gain they should. To get something usable out of yours (whether you have bad J201s or not), try replacing the 10R resistor with a 50K trimpot. If that doesn't work, then leave the trimpot in place and lower the three 15K resistors to 10K or lower. Won't be as great as the idol, but you might get something usable out of it. All of my drains are at about 1.2V and the pedal sounds like crap. I got my J201s from China so they are obviously not J201s. If I reduce the drain resistors to get 4.5V, can I expect it to sound right? you need to get it set to 4.5 volts. some of the chinese J201's just don't work properly but it's worth a try. i've had some that work just fine.